No matter where you live, how you were brought up, and what age you are, chances are, you love pizza. Pizza is America’s favorite food for a reason—because it’s delicious. Although it may not be the most nutritious meal out there, it has stolen the hearts of just about everyone. Think pizza is just crust, sauce, and cheese? Think again. There are loads of things that you may not know about this pie. 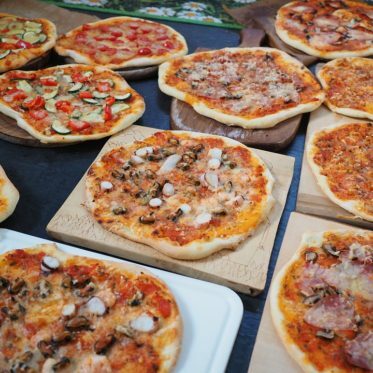 Take a look at our collection of facts about pizza that will not only make you hungry, but make you a little smarter. For gluten-free eaters, you understand the struggles of finding delicious foods that everyone can enjoy. Thankfully, pizza is one of them. Gluten is a protein that is commonly found in wheat, rye, and barley. Traditional pizzas are made with white or wheat flour, which does contain gluten, but many local restaurants in La Quinta offer gluten free options. There are thousands of gluten-free pizzas out there that can make it easy for those with Celiac Disease. Thanks to pizza’s main ingredient, a single slice of cheesy pizza can contain anywhere from 10 to 15 grams of protein. This not only gives you a boost of energy, but also helps your body build strong muscles and repaid cells. You may not know it, but many people fall short of the daily goal of 20 grams or more of fiber. Are you one of them? If you are, pizza can help. When your body does not receive enough fiber, you digestive system can’t work efficiently. With a few slices of pizza, you can lower your cholesterol, reduce your risk of heart disease, and lower your chances of certain types of cancer. A typical slice of pizza contains anywhere from two to three grams of fiber. Grab a slice and increase your daily intake of fiber. You can make pizza for virtually any meal. Have pizza for breakfast by loading up your favorite crust with eggs, sausage, bacon, and more! The possibilities for pizza creations are truly endless, making it the most accommodating meal out there.